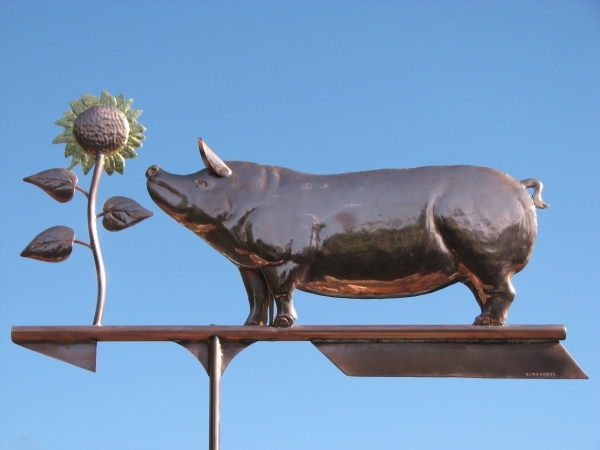 The inspiration for this Joyful Pig Weather Vane, Sus scrofa domesticus, was from a photo I saw in an old National Geographic magazine showing two kids sitting on a fence rail in the Australian Outback hosing down their pet pig with cool water in the 120° heat. The pig had the most blissful look of any creature I’ve ever seen. We’ve attempted to capture that joyful expression here. 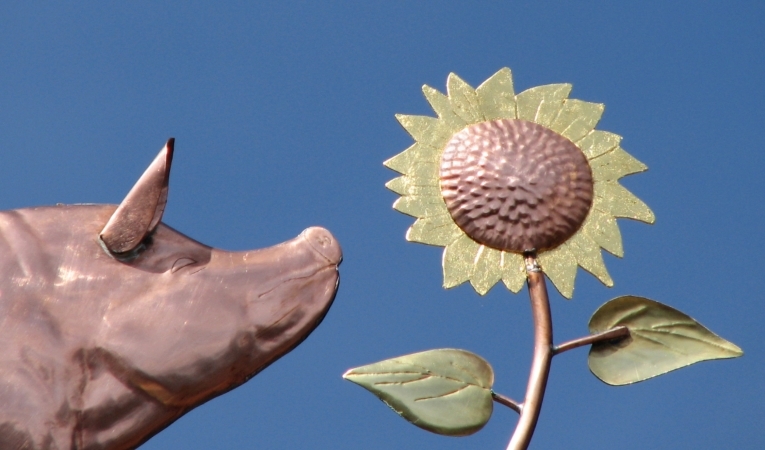 Later, a customer commissioned a variation on our The Joyful Pig Weather Vane by adding a Sunflower just in front of the pig’s nose. This customer selected optional gold leafing on the petals of the sunflower to create a bold accent and reflect the true color of a real sunflower. 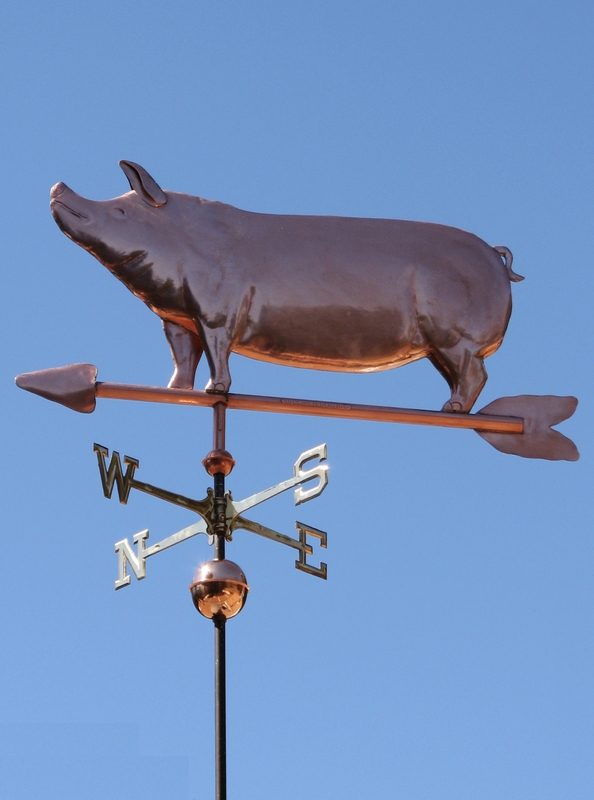 As with all our designs, we can customize your weathervane to reflect your own preferences. 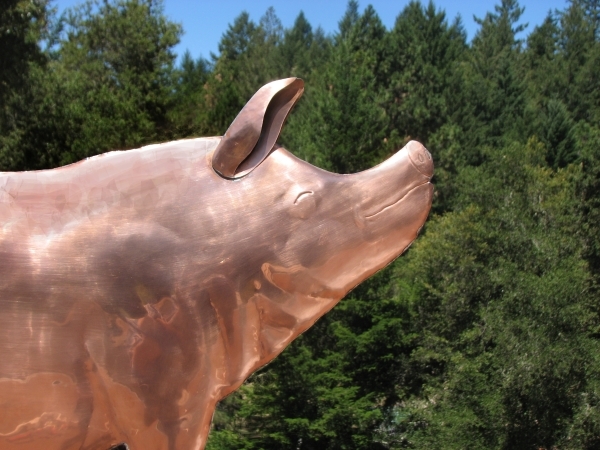 We would love to someday do a Charlotte’s Web version with a gold leafed Charlotte sitting below Wilbur on the arrow tip. 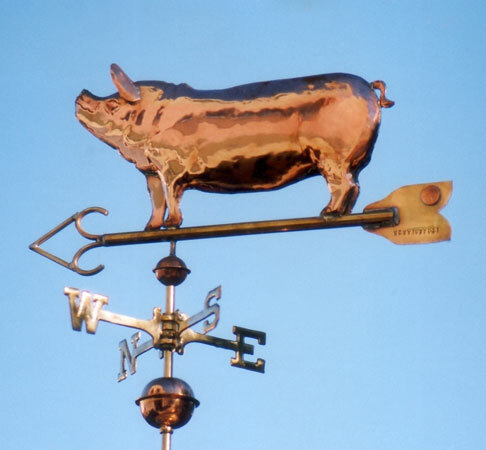 We have also made versions of this weathervane for customers wishing to celebrate the Year of the Pig from the Chinese Zodiac. 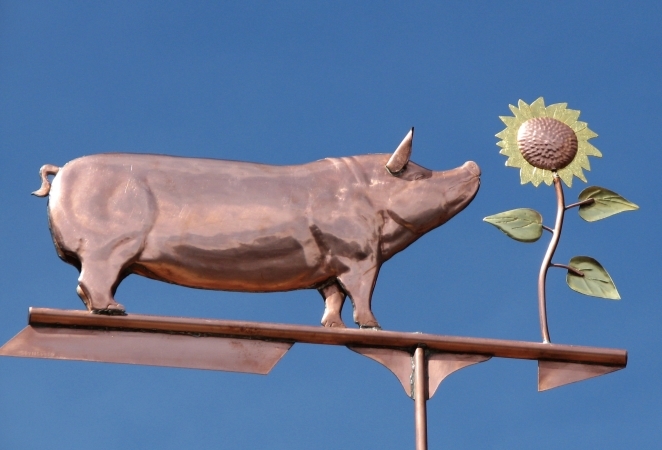 If you were born in 1935, 1947, 1959, 1971, 1983, 1995, or 2007 this might be an auspicious weathervane for you. You may also include a ‘lucky’ penny from the year of your birth inside your weathervane, taking advantage of a century old good luck tradition associated with handcrafted copper weathervanes. This tradition started back in the Victorian Age with the inclusion of a ‘lucky’ penny from the year the weathervane was made. If you are ever fortunate enough to find one of these old copper weathervanes, you may be lucky indeed. 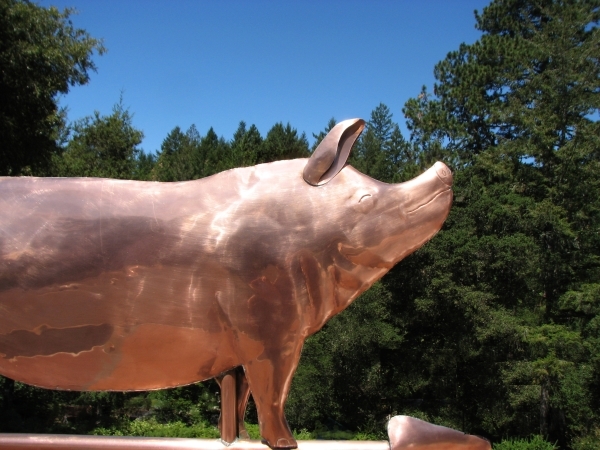 Prices for 19th century copper weathervanes have gone as high as $5.6 million dollars! Many a prize pig, along with other types of livestock, have been proudly nurtured and shown by 4-H youths throughout rural America. Countless ranchers, veterinarians and scientists got their start or training with this organization. Today 4-H has over 6.5 million participants and operates in over 80 countries.